The data in The payment gateway can be shared with external systems. 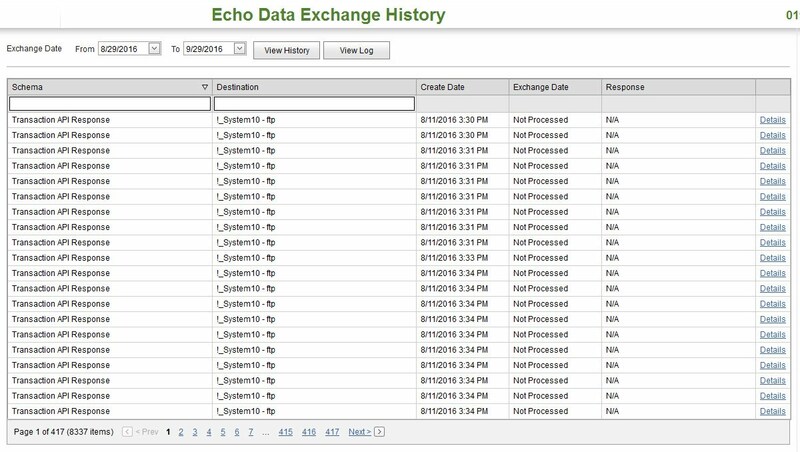 This module is called the Echo Data Exchange (EDE). Here merchants can define data output files, declare and configure external systems and lastly state the events that initiate a data exchange transaction. 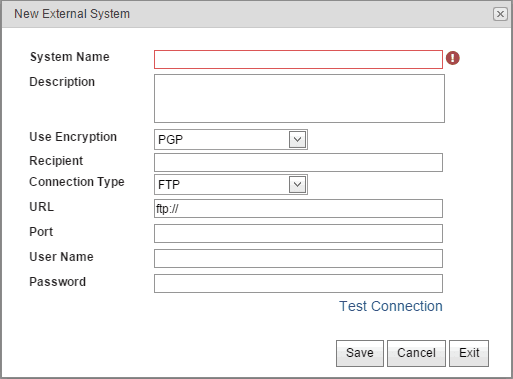 Users can assign the data files to external systems and define the connection to be used for transport. Events push data. These Events are defined as part of the system configuration exercise. The first step to activating a Hub transaction is the configuration of the data files that will be pushed out of the system. Schemas can be created, imported, edited, copied and deleted at will. If a Schema is assigned to an SDI event, it cannot be deleted. The system will notify the user of this condition when the Delete button is pressed. File Name – The name will be automatically generated by the system by combining the Schema Name and using the proper format extension. The user may change the name as he sees fit. 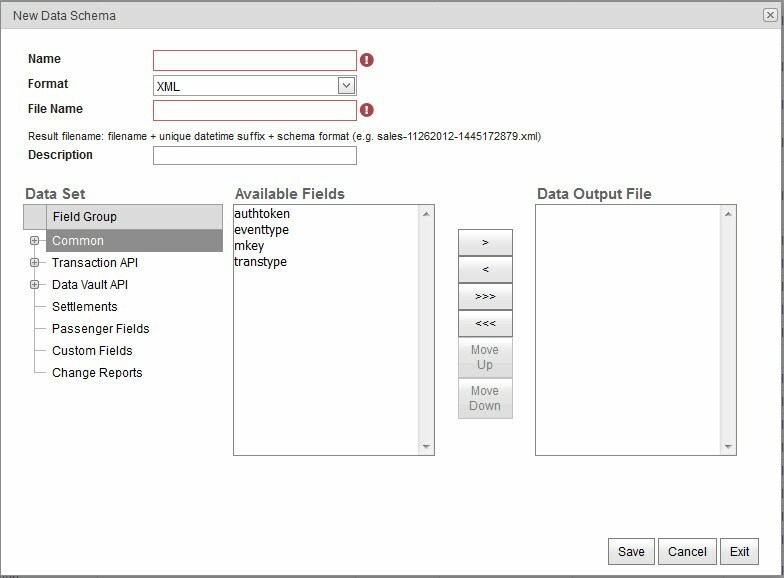 Data Output File – List of selected fields for current schema. The next step for the user is the declaration and setup of the external systems. Each data file movement is triggered by an Event. Events can be the time of day, rules or an actual system transaction. The system populates a grid with rows that expand. Each event can be selected by a checkbox and will be available for assignment later. 1. Assign Events to the list box by marking the checkbox. 2. Provide a list of all possible Events with descriptions of each. Custom Rules are created in the FBI Tools system. A rule can be created with Action = Event. User can modify the system default response fields by choosing Reply as the Event trigger. Doing so will use the newly created response in place of the system default response thereby customizing the response to the calling system. To revert back to the original system defined response file, the user should delete the Assignment and/or Schema. This page provides the list of all created events. Schemas can be assigned to systems in a one to many fashion. First the merchant chooses an event from a list box. All available events are visible. Then the grid with all created systems appears. 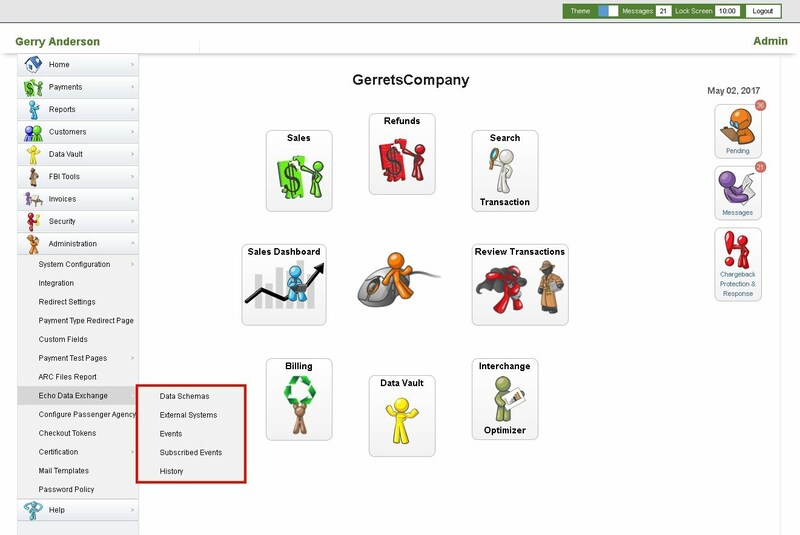 Next to each system the list box of all schemas is displayed. User should select at least one schema next to at least one system to proceed. Also here user can mark the event as Time Of Day by checking an appropriate checkbox next to the selected system. 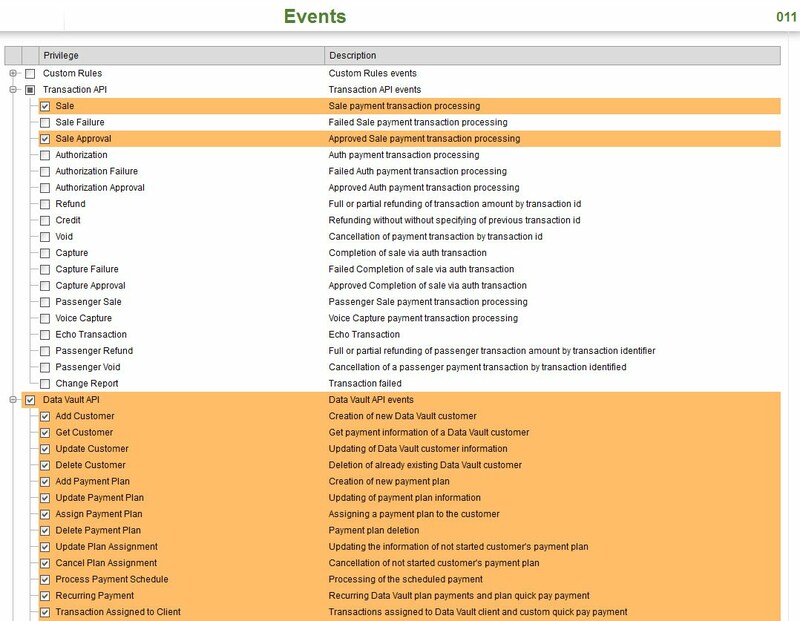 » After each event – If the item "After each event" is selected then the file would be created in the external system immediately after processing transaction. » In the end of day - If the item "In the end of day" is selected then the file would be created one time of day and it would contain several transactions that have been processed since the last "In the end of day" file creation. » Every few hours - If the item "Every few hours" is selected then the file would be created after the specified number of hours and it would contain several transactions that have been processed since the last file creation. 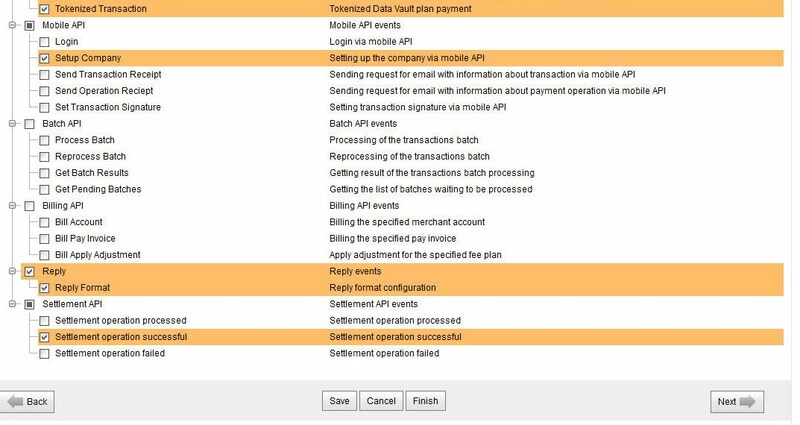 The system provides a running log and transaction movement table as shown below. The log can be accessed by clicking the Details link. Details of the transaction are displayed in a XML, CSV or TXT format (according to the data schema's format).